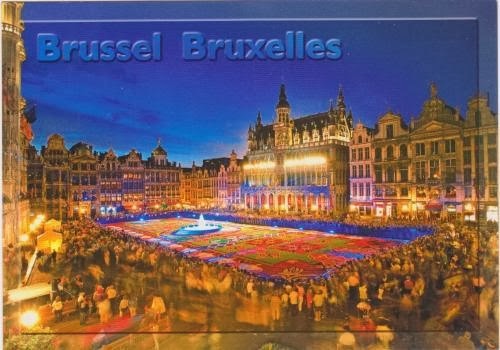 Item #1: Postcrossing Postcard from Belgium! I actually didn't notice that I'd received this postcard until this morning, when my mother playfully waved it in front of my face, knowing how much I love getting mail. Yesterday I'd been pretty occupied with my typical Friday morning errands, and relaxing (and playing on my 3DS) when I got home before I had some friends over. For whatever reason it didn't occur to me to check the mailbox, and the couple of times I did peer outside it must have been before the mailman had arrived. Yesterday was one of those rare days where I was too occupied by actual human interaction to think about what might be sitting inside of my mailbox, and in case you might be wondering, it didn't have anything to do with a boy. Okay, a boy was involved, but so were three girls. Alright, now I'll explain. Recently I was assigned a unique article topic from my PaperDroids editor. After submitting my last assignment on Snail Mail & Letter Writing, I emailed her and asked if she could assign me something unique, something that I didn't have to think up myself, so that I could challenge myself by writing something different. What she asked me to do was some sort of board game or toy review, since nobody had written anything like that for PaperDroids before. I jumped at the idea of writing a board game review. I love board games even if I don't own a great deal of them and I haven't been able to play them as much as I would like to. I decided that I should write my review on Settlers of Catan, because it's been established by so many as a Gateway Board Game (bet you anything that'll be the title of my article). I contacted my guy friend from Brock that owns the game, and my 3 best girlfriends that live in Welland, and I had them all over last night to play. 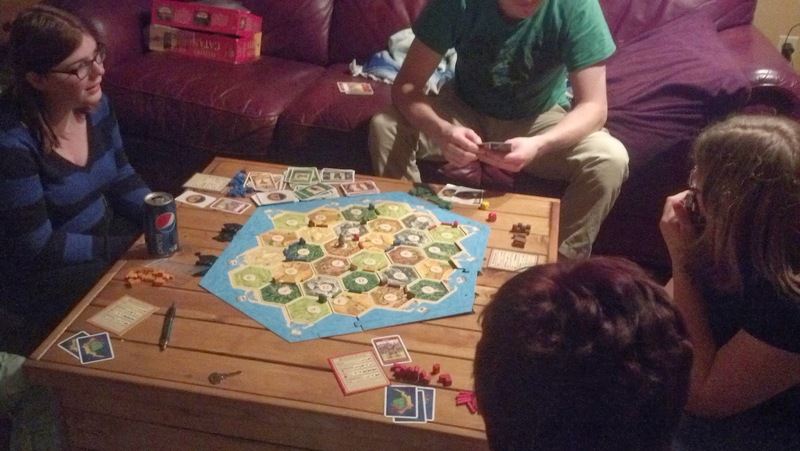 This was my first time playing Catan, as it was for my girlfriends - I've watched it played at Brock numerous times, but I'd never actually participated before. And it was really fun! We were all joking around (it is impossible not to make various "wood" jokes while playing this game) and torturing each other with the Thief of the game (because we rolled 7 so many freaking times! ), and it was a great night. There was also a lot of sugary junk food and Pizza Hut take-out to be had, and by the end of the night I felt pretty sick, but it was entirely worth it. Once we finished up with Catan, it turned out that my Brock friend was smart enough to bring along his copy of Cards Against Humanity. I have never known a group of people straight-laced enough to turn down this game, so of course we played, and we kept playing until we were out of black cards. It wasn't too late at night by that point, only 11 o'clock or so, but my friends and I were all feeling pretty drained. All in all we had a great time, and I got to catch up with everybody, especially the girls. It made me feel even more certain about sending each of my girlfriends something particular in the mail, and that's my top priority mailing project for the next little bit. That's about it for my Friday! Haven't written the Catan review yet, but I'll include a link on here once it's been published. I'll be sure to keep you guys posted!